We cannot think of a better way to relax than chilling on a beach and sipping cocktails. 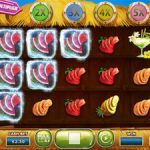 Well now you can with the latest video slot game Spina Colada from Yggdrasil. 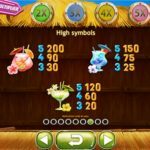 All the tropical fruits you will need are here on the reels and if you are lucky enough to match them on an active pay line, well then you should be prepared for some nice wins. Spina Colada is packed with special features. First we have Freeze & Respin that happens after every win. The symbols that are involved in a win will remain in place for one respin, and more matching symbols will continue the process until there are no more wins. Then we have 4 randomly occurring features and they are as follows: 2nd chance (blue) where you get 1 or 2 symbols for a guaranteed win, Full Line (green) where 5 matching symbols are added, Extra Wilds (pink) where you get one wild on the second and the third reel, Guaranteed Win Multiplier (yellow) is where you have a win and you start the Freeze and Respin feature. There are also free spins in this game and they are activated every time you fill up any of the 4 colored boards for which you will receive 4 free spins with the particular feature active. 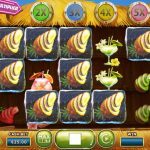 Spina Colada is one complex video slot game from Yggdrasil. We really enjoyed playing this game and unveiling all the secrets that it has, and there were many. But this means that you will never feel bored when you play this game. Everything we see here we like, starting from the design and the sound effects of the game and ending with the many wins it offers. This is definitely a game that is worth your time. For another great engaging slot you should consider playing Seasons a 5 reel slot by Yggdrasil.